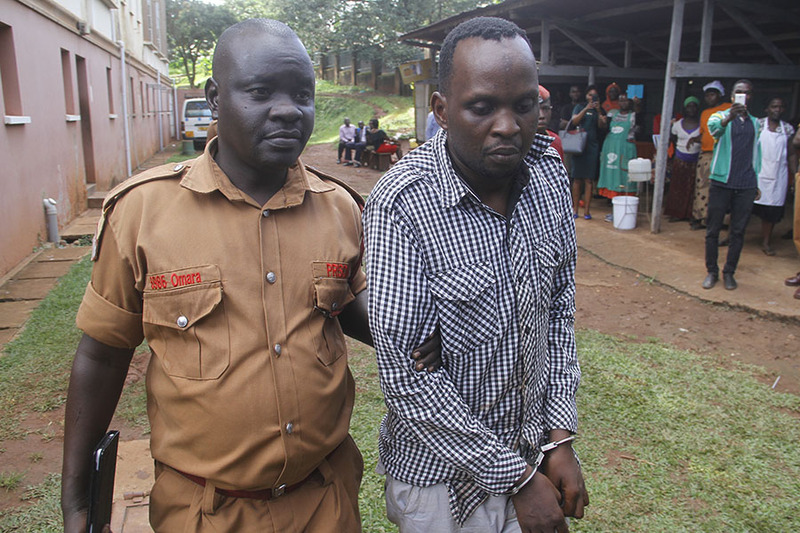 A prisons officer takes Herbert Kaddu to a vehicle that transported him to Luzira where he was sent on remand by Mwanga II Court in Mengo on Wednesday. 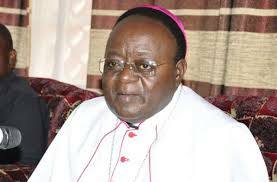 The Archbishop of Kampala Archdiocese Cyprian Kizito Lwanga has said the attack on his Anglican counterpart the Namirembe Diocese Bishop Kityo Luwalira cannot be taken in isolation from threats he himself has received from different security organisations. Speaking to journalists on Wednesday Archbishop Lwanga said it cannot be by coincidence that on the very day a man wielding a stick beat security at Namirembe during Easter prayers, and attacked Bishop Luwalira, was the same day a car without a number plate was seen at Lwanga’s home and when police was alerted, the car sped off. Congregants were in shock when Herbert Solomon Kaddu, who came driving a Super Custom, jumped out of the car, with a stick and wearing backcloth, running at terrific speed for the Altar. Kaddu tripped on a barrier between the Altar and the church aisle. 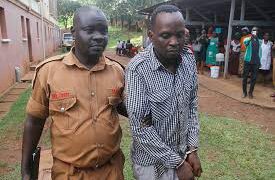 When he fell, lay readers, congregants and two police officers carried Kaddu out of church to Namirembe Police Station where he was charged with threatening violence. Kaddu has since appeared in court which sent him to the coolers in Luzira until April 24, when his case will be heard again. Kaddu claims he was possessed as he tried to take the stick and backcloth, which his late grandfather bequeathed to him, for the Anglican Bishop to burn them and pray for him. Archbishop Lwanga adds that on Easter Monday, April 2, he received a letter from unknown people with a list of clergy men who had freshly been recruited by various security organisations like ISO, ESO CMI, among others. He further refuted claims by Kaddu that he had come to be prayed for and said one doesn’t come to church with a club and bark cloth. So he cites ulterior motives. Police spokesperson, Emilian Kayima told journalists that the Archbishop should stay calm as security agencies handle the issues he has raised since Friday March 30. In his sermon on Easter Sunday at Rubaga Cathedral, Bishop Lwanga said the church had no intentions whatsoever to overthrow the government. During Good Friday prayers at Old Kampala playground, Archbishop Lwanga stunned the congregation when he accused intelligence agencies of misinforming the President that he plans to overthrow the government. He also said the security agencies were recruiting some of his priests to spy on him. Archbishop Lwanga, who is the current head of the Uganda Joint Christian Council, has often been at loggerheads with the government due to his outspoken nature about some wrongs such as corruption. He strongly opposed the lifting of the age limit for the President from the Constitution, prompting the President to warn church leaders off politics. President Museveni on Sunday made a phone call to Archbishop Kizito Lwanga of following the latter’s earlier remarks that he is being accused of plotting to overthrow the government. In a brief statement issued by presidential press secretary Don Wanyama on Sunday evening, the President’s telephone conversation was a precursor to future talks that the two leaders will hold.